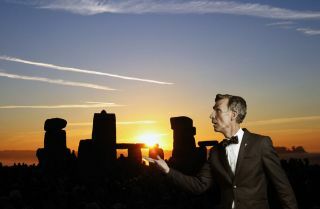 On June 21, Slooh will feature Bill Nye and Phil Plait in a webcast that will spotlight the summer solstice and the upcoming total solar eclipse. Looking for a way to celebrate the summer solstice and preview the biggest astronomical event this year? Tune in to the Slooh online community observatory's webcast today (June 21), which will feature fun facts and viewing information about the solstice and the total solar eclipse that will occur on Aug. 21 — the first such total solar eclipse visible in the continental United States since 1979. The hourlong livestream starts at 2 p.m. PDT (5 p.m. EDT, or 2100 GMT). You can watch the livestream on Slooh.com, or here on Space.com, courtesy of Slooh. Also joining the webcast will be meteorologist Ari Sarsalari, a severe weather expert and host of The Weather Channel's "The Ari Effect"; Matt Penn, of the Citizen Continental-America Telescopic Eclipse Experiment; and Paige Godfrey, Slooh's director of research. The live event will feature views of the sun streamed from Slooh's observatory partners, with close-ups from Prescott Observatory in Prescott, Arizona, and wide-angle views from New York, Chicago, Seattle and Hawaii. Sarsalari will help viewers choose the best eclipse-viewing locations, by looking at which locations are most likely to have cooperating weather in August. The other guests will share their appreciation for the eclipse. In addition, Slooh will preview its three-day eclipse celebration, which will take place in Stanley, Idaho starting Aug. 18. That area will experience 2 minutes and 13 seconds of totality. Penn's organization plans to set up a group of 60 telescopes run by amateurs and professionals to study the inner corona, part of the sun's atmosphere, during the eclipse, according to the statement from Slooh.